The note by David Vickers concentrates on the background to the music on this disc but is followed by a sentence which tells purchasers that if they want discussion 'of the dramatic contexts and music of the arias' the must visit Harmonia Mundi's website. Tut, rut! We did but could find nothing. My second comment is my old bugbear that a CD promising arias should not contain ten minutes' worth of orchestral music. Two more arias could have occupied that space. In a 'performer's note', Lawrence Zazzo states that 'Cosi stanco Pellegrino' from Bononcini's Crispo exists in three versions, which he and conductor David Bates incorporated into a hybrid aria, thus presenting something never heard before as such. Could not all three (or at least two of them) have been included instead of the non‑vocal items? Having said that, I must acknowledge that the Overture to Ariosti's Vespasiano is a bracing affair with much work for the brass, engagingly played by La Nueva Musica under Bates, himself a countertenor. (I heard him in Handel's Esther in St James's, Piccadilly, in London, where Leopold Stokowski was organist from 1902 to 1905.) The first aria is from Handel's Flavio, a fast piece with a slow middle section that includes a haunting oboe. Zazzo negotiates the swift runs with assurance. Of the excerpts from Crispo, 'Cosi stanco Pellegrino' is a lament, rather low-­lying for the most part and drawing Zazzo's warmest tone. It is sung by Crispo himself, but the second aria, actually from earlier in the opera, is for his half‑brother Costante and as its title, 'Torrente che scende', suggests it is quite different from the lament. It is expressed in full voice, rich in colour, with the orchestral accompaniment matching it with blazing horns and other wind instruments to support the singer. sung by Griselda. Despite the cross‑dressing, Pavarotti sang it elegantly but without the ornamentation that Zazzo includes in his attractive rendition. The last Bononcini selection is that from Muzio Scevola, a 1721 work whose second act was written by him, the first by Filippo Amadei and the third by Handel. 'Tigre piagata' covers a wide range, taking Zazzo to his darker timbre. Muzio likens himself to a tiger which 'does not mind death if it first achieves revenge by killing the buntsman'. 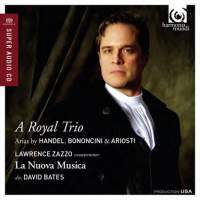 The CD’s title, 'A Royal Trio', refers to the three composers here writing for the Royal Academy of music in London. From Ariosti's pen comes Il naufragio vicino, which is not listed among his operas in The Viking Guide to opera and may be a stand‑alone aria, about a sailor fearing the storm. Again Zazzo's strongest tone is impressive as the vocal line moves at a slower tempo over the scurrying orchestra. Ariosti puts the orchestra in often low‑lying music in the recitative 'Spirate, o iniqui marmi' and the succeeding aria 'Voi d'un Figlio' in his Coriolano as the imprisoned hero regrets the grief of his lover Volunnia and mother Veturia. Zazzo is in rich, vibrant voice for this long scene, steady and resounding, as befits the character. In the dramatic accompanied recitative 'Orride larve!' from the opening scene of Handel's 1727 opera, Admeto is near to death and curses the tormenting Furies. It leads to 'Chiudetevi miei lumi', one of those sheerly beautiful slow arias of which Handel was a master, a piece in which a smooth and steady performance is essential. (Is someone going to tell me that Handel 'borrowed' it from another composer?) It receives such from Zazzo: a gentle flow of warm and soothing tone. One of Handel's great contributions is 'Va tacito e nascosto', with Giulio Cesare seeing himself as a hunter stalking his prey, in this case Tolomeo. Horns are prominent to splendid effect. Zazzo is once more in admirable voice and decorates the da capo. The longest aria is 'Tanti affanni', a slow movement in which Ottone sings of his lover Teofane, who has been kidnapped, and of his despair. This is a subdued solo, in which the central section matches the outer ones in tempo, and Zazzo himself continues the high standard of his singing on other tracks. Far different is the choice which ends the disc. This is the bravura aria 'Vivi, tiranno' from Rodelinda, to whose da capo Zazzo adds plenty of decoration and executes it with vitality and clarity. This is an accomplished recital from both singer and orchestra, the latter playing freshly under Bates's direction in a programme which contains some rarely heard music, such as the Ariosti pieces. (Apart from an aria from his Artaserse sung by Aris Christofellis on EMI, how often have his operas been represented on record?) 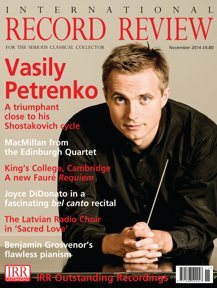 The warm recording was made in St John's, Smith Square, London.